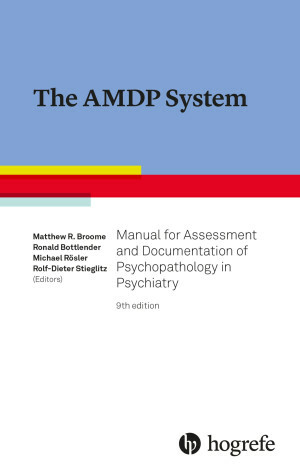 The AMDP System manual helps clinicians and researchers efficiently and accurately document psychopathological and somatic symptoms. The AMDP System is ideal for training medical and psychology students in the identification of psychopathology and an essential reference volume for psychiatrists, clinical psychologists, and researchers. Now in its 9th edition, the AMDP System is a widely used tool for documenting psychiatric symptoms in clinical and research projects. It is not only an essential part of many internal clinical documentation systems, but it is also a valuable instrument for training the identification of psychopathological symptoms. This new edition, now in English, involved the complete revision of the psychopathological and somatic symptoms, with particular attention to the elimination of ambiguities and inconsistencies, to the precision of definitions, to the exact differentiation of the self and other ratings, as well as to the user friendliness of the system. Taking account of developments in recent years in the description and rating of psychopathological symptoms, this latest edition of the AMDP System has been extended by an additional eleven psychopathological and three somatic symptoms and a new section on syndrome formation in the appendix. This clearly structured manual enables the standardized application of the system, making it an invaluable tool in the training of medicine and psychology students and an essential reference volume in the psychiatric field.